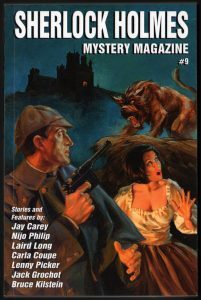 Sherlock Holmes Mystery Magazine presents the best in modern and classic mystery fiction! Issue #9 (July/August 2013) features a stunning Thomas Gianni cover plus the usual columns by Lenny Picker and Mrs Hudson, as well as the following stories: BONEYARD by Marc Bilgrey, BULLY FOR YOU by Carla Coupe, THE HEREAFTER PARTY by Paullette Gaudet, THE HOT STOVE LEAGUE by Janice Law, THE COIN AND THE CHEMIST by Nijo Philip, THE CASE OF VAMBERRY THE WINE MERCHANT by Jack Grochot, UP TO NO GOOD by Laird Long, WE’RE UPSIDE DOWN AND INSIDE OUT by Jay Carey, VALENTINE’S DAY by John M. Floyd, THE BLACKHEATH COLLAPSE by Sherlock Holmes (as Edited by Bruce Kilstein), and the original classic THE FIVE ORANGE PIPS by Sir Arthur Conan Doyle. 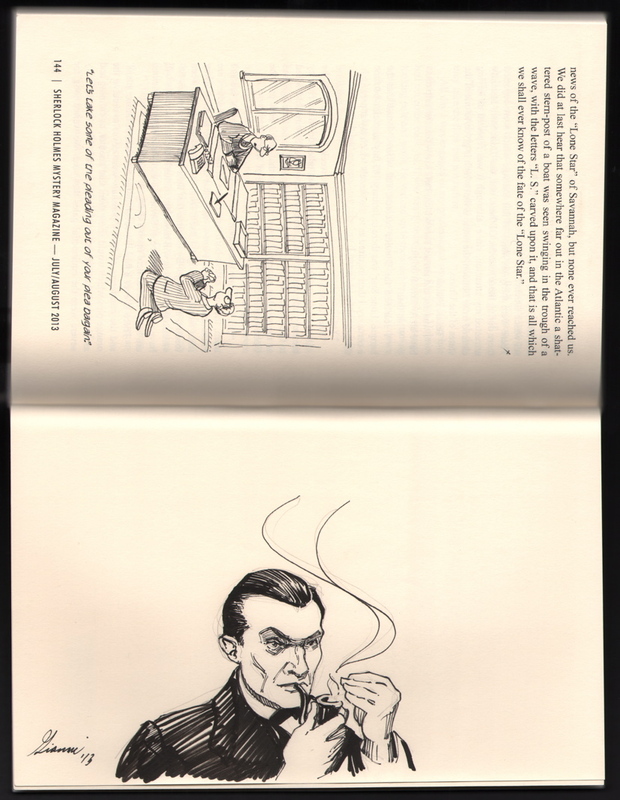 Additionally, this copy is signed and features an original art sketch of Jeremy Brett by Thomas Gianni. Please note, the sketch (drawn onto the last blank page in the book) is real. It is an actual, original art sketch drawn by hand by Gianni. It is not a pre-printed image in the book.